Ted Sienicki was born in 1948 in Elizabeth, New Jersey. After graduating with a bachelor's degree from Brown University in Providence, Rhode Island, he enlisted in the U.S. Air Force Reserve to attend Officer Candidate School on April 18, 1969, and entered OTS on July 22, 1969, graduating with a commission as a 2d Lt on October 21, 1969. Lt Sienicki attended Undergraduate Pilot Training at Randolph AFB, Texas, from November 1969 to April 1970, and then switched to Undergraduate Navigator Training, earning his navigator wings at Mather AFB, California, in April 1971. He then completed F-4 Phantom II Combat Crew Training as a Weapon Systems Officer (WSO) in January 1972, followed by service as an F-4 WSO with the 25th Tactical Fighter Squadron at Ubon Royal Thai AFB, Thailand, from February 1972 until he was forced to eject over North Vietnam and was taken as a Prisoner of War on May 3, 1972. After spending 330 days in captivity, Capt Sienicki was released during Operation Homecoming on March 28, 1973. He was briefly hospitalized to recover from his injuries at Westover AFB, Massachusetts, and then attended Undergraduate Pilot Training at Williams AFB, Arizona, earning his pilot wings in October 1974. Maj Sienicki later completed F-111 Aardvark Combat Crew Training and served as Chief F-111 Flight Test Pilot with the Sacramento Air Logistics Center at McClellan AFB, California, from December 1979 to December 1983. He retired from the Air Force on August 1, 1989. 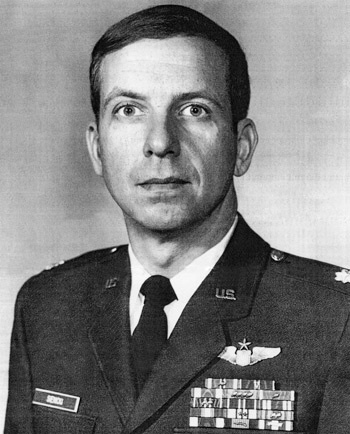 First Lieutenant Theodore S. Sienicki distinguished himself by extraordinary achievement while participating in aerial flight as an F-4 Weapon Systems Officer in Southeast Asia on 7 April 1972. On that date, Lieutenant Sienicki participated in a rescue effort to save a fellow airman downed in hostile territory. In spite of the hostile force's efforts to stop the rescue attempt by directing countless rounds of antiaircraft artillery and small arms fire at rescuing aircraft, Lieutenant Sienicki placed his ordnance on the target, subduing the hostile forces and allowing the rescue effort to proceed smoothly. 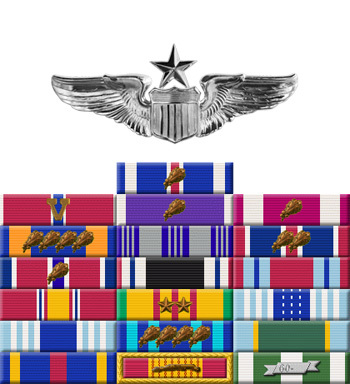 The professional competence, aerial skill, and devotion to duty displayed by Lieutenant Sienicki reflect great credit upon himself and the United States Air Force.